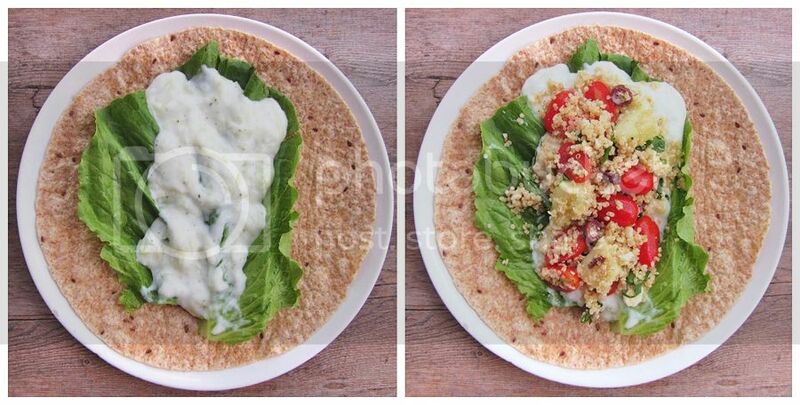 A couple of months ago, I made these Southwestern quinoa wraps with chipotle yogurt dressing and absolutely loved them – Even better, Ryan (who is usually skeptical of quinoa) loved them, which made them an even bigger success! I knew this was something I’d want to repeat often for a healthy, protein-filled lunch, so I started thinking of other versions that I could make to change things up a little. Since I loved this Greek quinoa with cucumber, tomatoes, olives, and feta (which I’ve talked about in my summer quinoa recipe roundup), I decided to use it in a wrap combined with an easy tzatziki sauce. 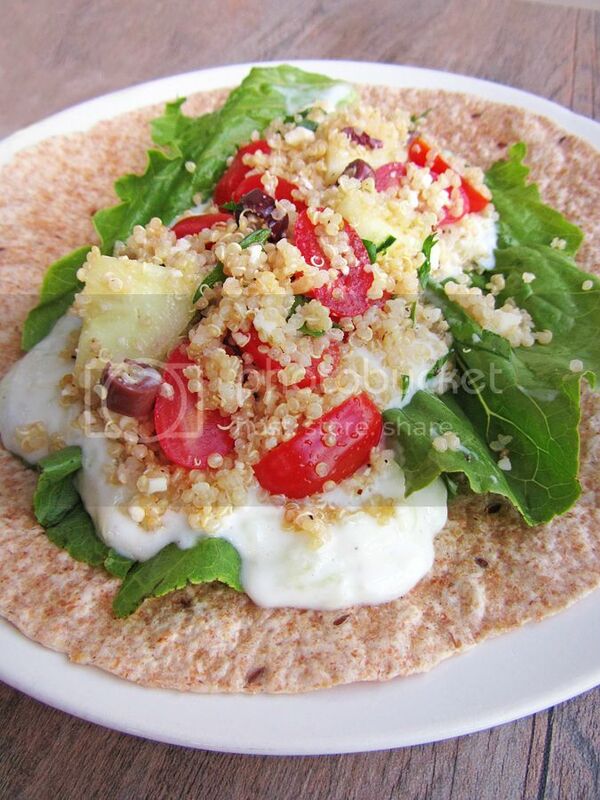 I already knew the quinoa on its own was delicious, but combined with a cool and creamy yogurt sauce, crisp lettuce, and a whole wheat tortilla wrap, it’s even better – plus its more filling this way, making it a great healthy option for lunch or dinner. I don’t recommend making the wraps too far ahead of time because the tzatziki could make the wraps soggy, but I found that making a wrap in the morning and eating it for lunch was still fine – just make sure you lay the lettuce down first before the sauce to protect the tortilla from getting soggy! I hope you all have a great weekend! I’ll be back on Monday for a great giveaway for my Ontario readers, so be sure to stop back then! And now that it’s official Fall, I’ll have plenty of fall recipes coming your way soon! Peel the cucumber, cut it in half lengthwise, and scoop out the seeds. Grate the flesh into a strainer, sprinkle with salt, and let sit for 20 minutes. Use your hands or a paper towel to squeeze out as much liquid as you can from the cucumber. Add the cucumber to the yogurt. If you have time, you can strain the yogurt through a cheesecloth for a couple of hours first to drain out some of the water and thicken it, but I don’t bother. Add lemon juice, mix everything together, and season with salt and pepper to taste. Keep in refrigerator until ready to use. Bring 2 cups of water to a boil in a medium saucepan. Add quinoa, cover, and reduce to a simmer for 15 minutes. Remove from heat and keep covered for 5 minutes. Remove lid, fluff with a fork, and transfer to a large bowl to let cool. Meanwhile, mix the cucumber, tomatoes, olives, parsley, and feta together in a medium bowl. In a separate small bowl, whisk together the olive oil, red wine vinegar, salt and pepper for the dressing. 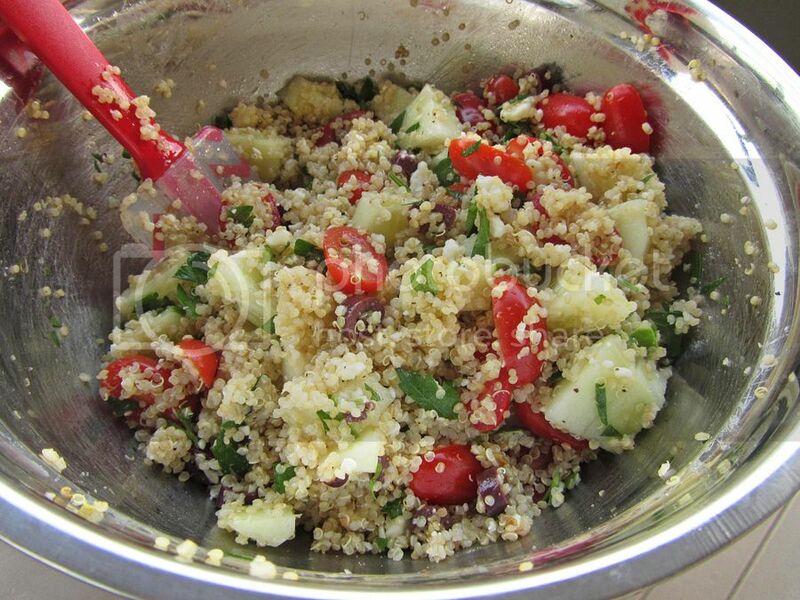 Add the cucumber mixture to the quinoa and toss together. Drizzle the dressing overtop, and mix to coat. Season with additional salt and pepper if desired. Lay a lettuce leaf in the center of each wrap. 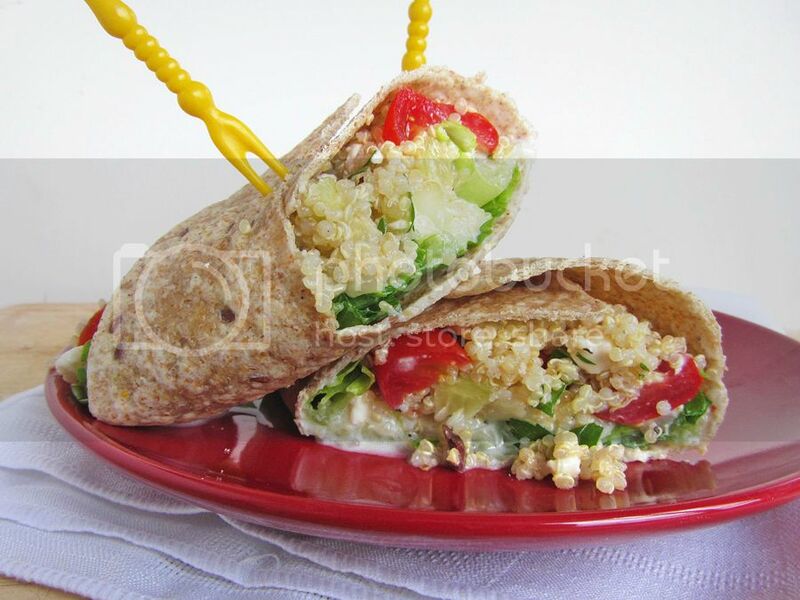 Top with tzatziki sauce and quinoa, wrap, and serve. I always have quinoa in the house, so healthy. Nice looking wrap. Hi Natalie, wow these look delicious! I've been trying to include more quinoa in my diet and this looks like a great recipe to add to the rotation! Thank you for sharing with me and making my morning all the more delicious. I hope you have a great end to your week. I've never seen frozen quinoa wraps .. they would be more convenient but these were still really easy! Thanks so much for stopping by, Monet! Just saw your banana flaxseed muffins - I think those would make MY morning much more delicious! That's what I did! 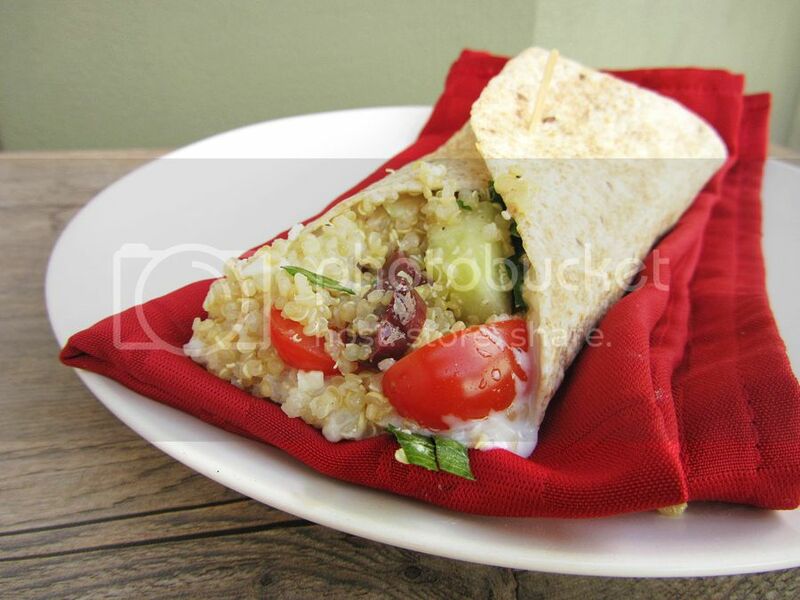 I recommend the southwestern wraps too if you like the idea of quinoa wraps! Summer Dishes I Haven't Shared Yet!